Behold, a teenage Clyde Barrow in a sailor suit. 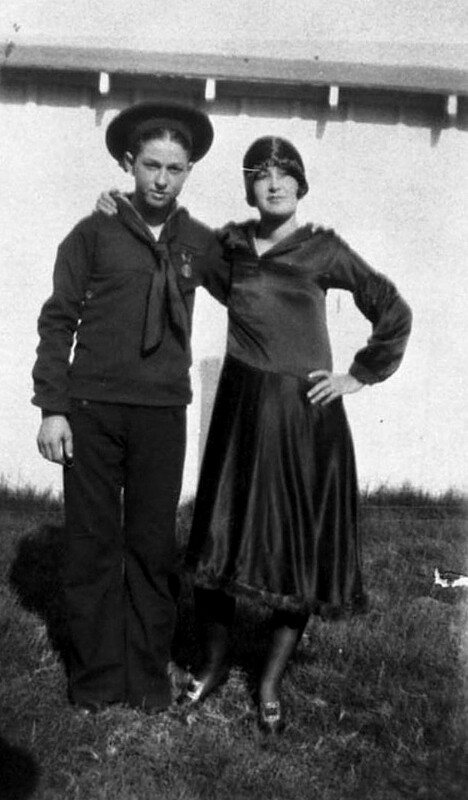 Bonnie & Clyde lore has it that Clyde attempted to join the United States Navy but was rejected because of lingering problems from a childhood illness, but on a quick sprint across the internet, I’ve been unable to find any specifics about Clyde’s having tried to enlist in the Navy. But he was certainly pro-navy: not only does he appear to have enjoyed wearing the sailor’s outfit, but he apparently also had a “USN” tattoo. But what about this outfit? It certainly looks like a navy uniform. Is it an actual navy uniform? Maybe a relative’s? Is it a costume? Is it some sort of facsimile someone whipped up for him so he could slip into it whenever he felt like it? Is he play-acting? Dressing up for a party? And what about that “medal”? The back of this photo reads “Nell Barrow and Clyde / 1925.” Could it have been 1926 instead? On his birthday in 1925, Clyde (who was born on March 24, 1909) would have turned 16 years old. The minimum age for enlistment in the U.S. Navy jumped back and forth between 17 and 18 years old, but by the time his birthday rolled around in March of 1926, the enlistment age was 17. By the end of that year Clyde had been arrested for stealing a car, and even though charges were eventually dropped, this police record may have been enough to prevent him from enlisting even if he hadn’t failed a physical. Whatever the case, if he DID want to join the navy, he had a very limited window in which to do it: from his 17th birthday on March 24, 1926 to his first arrest on December 3, 1926. Imagine how different things would have been if Clyde Barrow had joined the navy and sailed the Seven Seas instead of hooking up with Bonnie Parker and terrorizing the Southwest? Photo, titled “Clyde Barrow and sister Nell Barrow, Dallas, Texas,” is from the University of Texas at San Antonio Libraries Special Collections, and is accessible here. Photo loaned to UTSA by Henry J. Williams (other photos from Mr. Williams’ collection are dated 1926, some of which I used in my previous post “Babyface Barrow — 1926” here). If anyone has more information about Clyde’s uniform in this photo, I’d love to hear from you. Similar uniforms can be seen here. A list of requirements to join the U.S. Navy — published in The Scranton Republican on Feb. 10, 1927 — can be found here. For previous Flashback Dallas posts on Bonnie and Clyde, click here. Throughout most of U.S. history, and certainly in the 20th century, lack of criminal involvement (no police record as in the article) was a requirement for military service. But that requirement was regularly ignored, and joining one or another of the military organizations was a common way for young men to escape prosecution, often by agreement with law enforcement. A person accused of a felony could agree to join, and the charges would be dropped.